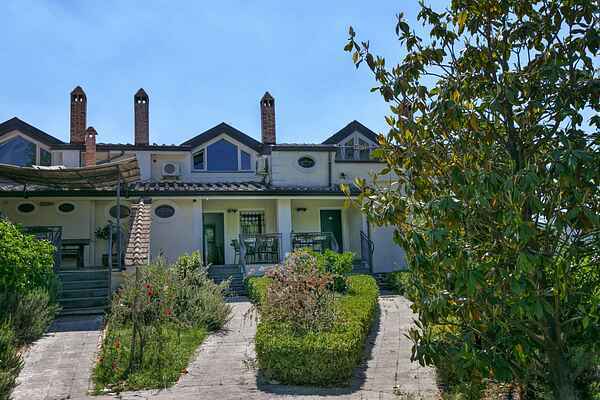 Apartment Mandarino is located in a luxury and comfortable holiday resort and is a carefully restored old farmhouse on grounds of 12 acres olive gardens and nut trees with panoramic views on the Picentini mountains and Salerno. It is located near the centre of Salerno and exactly between the magnificent Amalfi Coast and the Cilento coast. The holiday accommodation has a total of 18 apartments and guest rooms, a fitness room and a Spa room (for a fee) and a nice refreshing swimming pool. There also are 2 restaurants where typical regional dishes are served. Apartment Mandarino is a classic, rural and atmospheric apartment. It is a fabulous place to visit the beautiful coasts, authentic villages, archaeological digs and nature parks. There are plenty of opportunities for walking or cycling in the area.